Matt Watkinson's career in design got off to an unfortunate start when he found himself entangled in his own Meccano crane at the age of five. He spent his teenage years at a boarding school where he dreamed of becoming a concert pianist, but by eighteen he had run out of talent and went to university instead. Whilst studying for a business degree, he got a job at a small design agency where he learnt the basics of how websites get designed and built, and became very interested in how people interact with technology and businesses. His career break came in 2005, when he was offered the role of leading the user experience design of P&O Ferries website; a site which became a benchmark in the travel industry. In 2006, Matt combined his lifelong interest in cars with a new-found love of photography, and spent a year shooting features for magazines including BBC Top Gear and Car Magazine. After discovering that hotel rooms are the same the world over he returned to design, joining a team of consultants on the re-design of Argos.co.uk. The new site made over £1 billion in its first year and won Retail Week’s Online Retailer of the Year in 2008. After that getting work was noticeably easier. Matt has since gone on to help some of the world’s biggest brands get their customer experience right, primarily when using things with screens (websites, mobile apps, and software), but also on joining all the touchpoints together to create a single experience. He has worked with household names, design agencies and management consultancies in the UK, Europe and America. 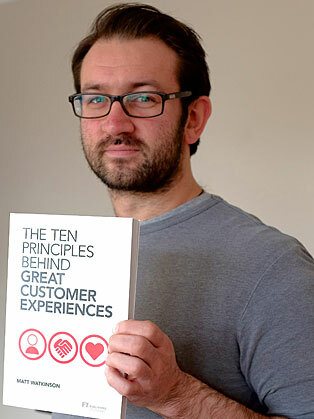 In 2011 he was offered a publishing contract with the FT Press to write The Ten Principles Behind Great Customer Experiences, which was released worldwide in December 2012. He is also a member of the Chartered Society of Designers.